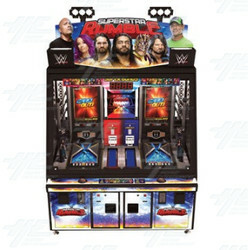 WWE Superstar Rumble is a ball shooting arcade game where players must shoot the ball into the WWW Champion Belt. If it doesn't go into the belt, the ball will travel down the pin and the player will receive points for where it lands. If 5 balls make it into the WWE Champion Belt, the machine will shoot 10 balls by itself.